The Khitrik Family in Watertown, MA is very involved in the Jewish Food movement in a number of ways. L’dor V’dor, they are passing Jewish food traditions from generation to generation, modernizing them along the way. Along with his mother, Alex Khitrik owns Inna’s Kitchen, a stand at the Boston Public Market, a year-round locally sourced food market. Soon they are opening a ‘culinaria’ in Newton and, for this location, they are partnering with Rabbi Benjamin Newman to attain Shtiebel Eco-Kosher Certification. They’re on a mission to preserve culinary traditions while making them relevant for a more health conscious and sustainability-minded customer. 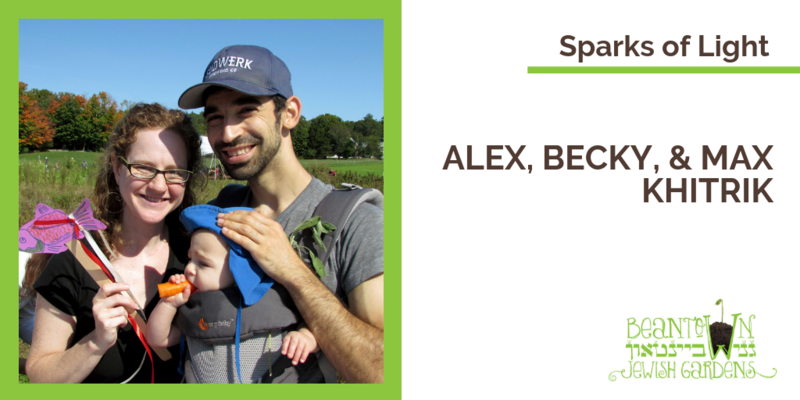 Alex says he was inspired by his involvement with Moishe Kavod House, “We founded the restaurant with a dedication to sustainability, ethical practices, and modernizing traditional dishes.” He often caters shabbat dinners, holiday dinners, and other events hosted by Becky, a cantor and clarinetist. Their son Max (1 year) is the happy beneficiary of his Baba (Grandmother Inna)’s cooking. He especially loves blintzes and matza ball soup. Perhaps a budding gardener, he scarfs down anything that comes from the ground (including grass); however his current obsession with avocados and oranges may not win him Locavore of the Year. “Both of us grew up feeling connected to the earth and the outdoors,” Becky and Alex said. Before they married, they created a large garden plot and served some of their own produce at their wedding reception, which Inna’s Kitchen catered. “We try, when possible, to eat locally, to support our environment, health, and community.” Becky did, however, draw the line at indoor vermicomposting, something Alex briefly maintained in the kitchen. They learned the hard way that worms kept by (or above) appliances that vibrate (such as washer/dryers) will attempt to escape. Alex and his mom have presented at the Boston Jewish Food Conference, including teaching how to make sauerkraut and making Borscht with conference participants while exploring Eastern European variations to the dish. Max participated in 2018 for the first time! Cantor Becky has brought the families of one congregation she serves, Temple Beth Zion, to our Sukkot on the Farm event for numerous years, and led singing circles, craft projects and ritual practice along the way. We’re so inspired by how Becky, Alex, and Max and Inna, have brought their passions for Judaism and food into both their personal and professional ecosystems. They are truly living their values. If you find yourself inspired, consider a donation to Beantown Jewish Gardens. Your gift will sustain our work and expand our reach, helping more people live their values. Previous ArticlePrevious Post: Developing an Ethical Food Statement: Ta’am Tov!